An iconic Los Angeles broadcaster makes his curtain call. 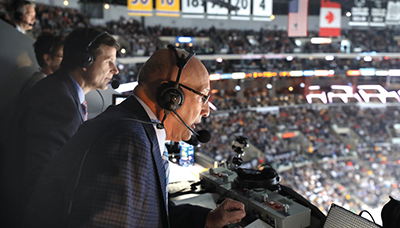 PHOTO: Courtesy Los Angeles Kings Bob Miller made one final call at the Staples Center in April to complete a 44-year career with the Los Angeles Kings. Bob Miller found no greater thrill than covering live action. He embraced the opportunity to witness history every game and he painted a vivid, accurate, and fair picture for listeners and viewers alike. But after a 44-year tenure as the Los Angeles Kings' play-by-play announcer, the time finally came to step away from the mic. Miller, 60BA, bid farewell to the National Hockey League this past spring in a legendary last call at the Staples Center, featuring the same Chicago Blackhawks matchup as the Windy City native's first game on Oct. 10, 1973. Serving as the announcer for 3,353 Kings' games, including a pair of Stanley Cup titles, Miller became a broadcasting icon. After a series of health issues the past couple of years, including quadruple-bypass surgery, Miller announced his retirement in March—but not without one more appearance before the home crowd. Fans gathered outside the Staples Center hours before the game for a fan festival and wrote personal messages to the Hockey Hall of Fame announcer. Inside the arena, Kings players wore special No. 44 warmup jerseys with "Bob" printed on the back, "Thank You, Bob" placards were placed on all 18,230 seats, and video tributes played on the scoreboard, which revealed a 3-2 Kings overtime win. The former UI communication studies major at first wasn't sure he was cut out for play-by-play. Fired from his first job covering high school football for WQUA in Moline, Illinois, Miller later broadcast Hawkeye football and basketball as a UI upperclassman for the student radio station, WSUI. "[WSUI] allowed students to do most of the on-air work and learn by making mistakes," Miller says. "We had the chance to stay on the air and get better every time." Following jobs in Oelwein, Iowa, and Milwaukee, Miller's first foray into hockey for the University of Wisconsin in 1968 came on just a few days' notice. In mere seconds, he was hooked. "The moment they dropped the puck, I was in love with the game of hockey," Miller says. "Trying to keep up with the speed of the game and doing it accurately—I really enjoyed doing that. Every game I was wondering, what will I see tonight that I have never seen before?'" The Los Angeles IOWA Club is partnering with the Kings for an event to honor Miller in January. For more details, visit lahawkeyes.com. Watch the Los Angeles Kings' farewell video to Miller at nhl.com/kings/fans/bob-miller. To read our previous story about Miller, visit bit.ly/MillerKings.